The Sports Department and the Chess Club organized last Saturday, December 12, the Local School Sports Chess Phase, in the Municipal Sports Pavilion "Manolo Ibáñez", where a total of 84 schoolchildren from all the teaching centers participated. the locality, belonging to the categories alevín and open, what supposes a record of participation in this sport modality. and in the individual modality, Jaime Cánovas Crespo (Santiago) was in first place, Francisco López Martínez (La Cruz) was second, and Joel Encalada Andreo (Santiago) finished third. and finally, in the individual modality Carmen García Requena (Juan de la Cierva) was the champion, followed by Gustavo Rodríguez Martínez (La Milagrosa) and Trinidad Cerón Amaguaya (Juan de la Cierva), in the second and third place respectively. 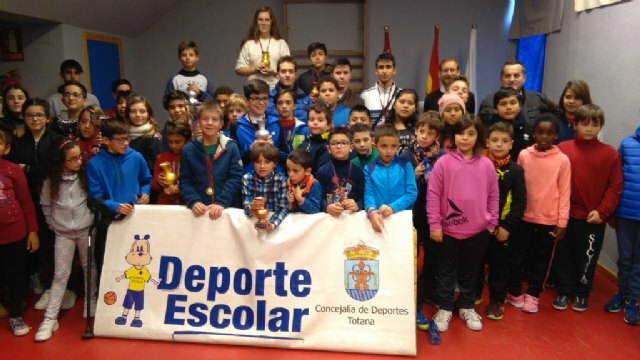 The competition concluded with the delivery of trophies and medals to the top three finishers, both in juvenile and open mode, by the City Councilor of Totana City Council, Carlos Ballester Méndez, and the president of the Totana Chess Club, Pedro Garre. In addition, the best qualified will have the opportunity to participate in the Regional Final School Sports Chess, organized by the General Directorate of Sports of the Region of Murcia, and this year will precisely take place in Totana, specifically in the Exhibition Hall " Gregorio Cebrián "on January 27 and February 17.